Happy Memorial Day! Today, as we honor our service men and women, we'd like to present our list of the most poignant battles in science fiction and fantasy film, television and literature that highlight the sacrifices made by those on the front line to protect their communities. Warning: These synopses may contain spoilers for the books, movies and TV shows they are about. We suggest you proceed carefully and read on a case-by-case basis! The Battle of Yonkers, World War Z. The universe: Present-day Earth in the midst of the great zombie uprising. The creator: Author Max Brooks. The stakes: The zombies have overrun cities and countrysides across the globe, and the U.S. military take a desperate stand in the New York city of Yonkers, the first such attempt at throwing all the might of the military at the zombies. The armed services use their most advanced weapons and technology in an effort to exterminate the undead pouring out of New York City. The battle also was designed as a propaganda tool to show the public that the armed forces could contain the zombie threat, and it was broadcast on national television, with soldiers on the front line toting video cameras. The outcome: Utter failure. The human army was decimated by the waves of the undead, whose shambling onslaught was impervious to all the high-tech gear the military brought to bear. They were plagued with problems, everything from a lack of ammunition to soldiers who had been trained to shoot the enemy's torso, as is traditional, rather than their heads. Worse, a horrified national television audience looked on as soldiers were eaten alive while the lucky survivors fled in panic. The fallout: Death and mayhem and loss of morale. The United States abandoned the eastern part of the country and retreated west. 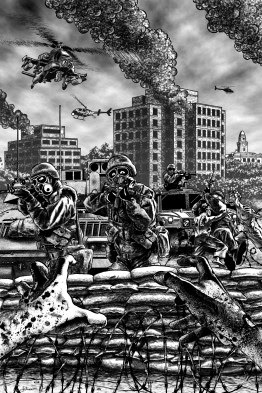 But the Battle of Yonkers did spark a radical rethinking about how to effectively use military techniques to kill zombies. Military strategists learned how to outfit and employ their troops and utilize their weapons to effectively deal with an unceasing, untiring foe. In the end, they are successful, and the description of the winning military strategy is both bloody and bloody brilliant, like the rest of the book. The Attack on King's Landing, A Clash of Kings. The universe: Westeros, a fictional medieval kingdom torn apart by a civil war. The creator: George R.R. Martin in the second book in his Song of Ice and Fire series. The books are the basis of the new HBO series Game of Thrones. Stannis before his crushing defeat. The stakes: With King Robert dead, the kingdom of Westeros is torn apart by factions from different parts of the kingdom all vying for the Iron Throne. Robert's brother Stannis leads an attack on King's Landing, where King Joffery and the Lannister family are in power. The attack includes a water assault, as King's Landing is bordered by a great river. Stannis' 20,000 men will have to face down a few thousand Lannister troops -- easy odds, right? The fallout: Tyrion proves his brilliance as a military tactician, Joffrey the terrible maintains his hold on the throne, and Stannis retreats to lick his wounds and regroup. Meanwhile, life in Westeros continues to break down, with the common folk subject to attacks, murders, starvation and all manner of violence and chaos that happens during a civil war. The situation does not improve and instead deteriorates as the unrest continues ... for two more books. We'll see what book five, scheduled to be published in July, will mean for Westeros and the warring factions. The universe: The Cylons, created by humans, have risen against their masters, destroyed their home planet and stranded the survivors in space. Don't we all secretly want to be like Starbuck? The stakes: This universe is all about resources: ships, air, water, fuel, you name it. If the Colonial Fleet is unable to get anymore tylium, their ships will run out of fuel. No more fuel means no more jumping away from the Cylons as they chase the humans across the galaxy, hell-bent on killing every last one of them. Also needing tylium, the Cylons have already staked a claim on the tylium-rich asteroid and are processing the mineral for, yup, you guessed it, fuel. Led by Starbuck (Katee Sackhoff), Galatica comes up with a crazy plan to lure the Cylons away from the base and, with some Skywalker-esque flying by Apollo (Jamie Bamber), hopefully destroy the Toasters' refinery. The outcome: Humans win! FRAK YEAH! The fallout: More than anything, this battle represented a time in Battlestar when it was just Humans v. Toasters. This was long before some people got fat and some people grew beards (and a harem) and some people lost an eye. Before different Cylons had a slew of names, agendas or alliances and the politics of the remaining Cylons overtook the hearts and minds of the writers. This battle was good ol’ fashioned “we have better military strategies than you.” The Galactica crew and fleet are on their own. Apollo showed his chops as a fighter pilot and proved that he, too, can be reckless and kickass under pressure. Starbuck showed her ability to choreograph battles and play nice with the Battlestar brass, if only for one episode. Ultimately, the Hand of God battle showed that humans, too, have a plan. The universe: The Independents, also known as "Browncoats," are fighting against the Alliance for their freedom. The creator: The unstoppable Joss Whedon. We love him, we hate him (when he kills off our favorite characters), and we worship his creations. Sergent Malcolm Reynolds, hearing that reinforcements aren't coming. The stakes: In 2511, the Independents were slowly losing the vicious war against the Alliance. They had held their ground on the planet Hera for weeks. Sergent Malcolm Reynolds and Corporeal Zoe Alleyne of the 57th Overlanders battalion were tasked with holding the post at Serenity Valley. This was to be the last stand for the Independents, who had put the majority of their soldiers and weapons there. The outcome: Because of superior numbers and more advanced technology, the Alliance viciously destroyed the Browncoats. The loss of life was great, with a 70% causality rate for the Browncoats. That number increased as the Alliance starved the remaining rebels out. Many died from starvation and their wounds, since medical supplies ran out. Sergent Malcolm Reynolds and Corporeal Zoe Alleyne are the only two survivors from the 57th Overlanders. The Battle of Serenity Valley is the major turning point in the war and gained the Alliance the upper hand. The Independents finally fell a few months after. The fallout: With Serenity Valley lost, the Independents lost most of their men and almost all of their arms. It was easy for the Alliance to finally finish them off, and it cleared the way for the Alliance to take over the core planets. Beaten and broken, Malcolm and Zoe finally pick themselves back up and purchase a Firefly class ship. They name her "Serenity" in honor of the battle and continue to give the middle finger to the Alliance as they smuggle goods between planets for fun and profit. The universe: The unforgettable and genre-defining world of Star Wars. The Rebel Alliance's last stand against the forces of Sith darkness, the Empire. The creator: George Lucas, who can't leave well enough alone and keeps reissuing the Trilogy. The stakes: After a huge Rebel Alliance win with the destruction of the first Deathstar, the Empire had been slowly clawing their way back. A second Death Star was in production over the small forest moon of Endor, home to Teddy Ruxpin-lookalike creatures called Ewoks. The Rebel Alliance had suffered setbacks, notably the capture of Han Solo by fearsome bounty hunter Boba Fett. If the Empire could get the Death Star operational again, it would be the end of the Rebels and the Jedi. The outcome: With Solo rescued by Princess Leia, the Rebel Alliance deploys to Endor to attempt to again destroy the fearsome Death Star. Word that the Emperor Palpatine and Darth Vader are both on the Death Star causes them to act quickly. Unbeknown to the Rebels, the Empire had been leaking false information, and it is an ambush. In space, an entire fleet of Star Destroyers await the Rebels ships, and on the ground, a hoard of Stormtroopers are ready to destroy the troops deployed there. Aided by the fuzzy yet oddly good in battle Ewoks, the Rebels on the ground succeed in fending off the Stormtroopers. Overhead, the firefight around the Death Star rages. Luke Skywalker, on the Death Star, finally faces his father, Darth Vader. Ultimately, Skywalker defeats his father who in turn assassinates the Emperor. The fallout: The Death Star is again destroyed, and the Rebel Alliance finally gain the upper hand. The Empire is basically finished. Leaderless and powerless, the Empire is vulnerable, and the Alliance is able to stomp out their remaining strongholds and return peace to the galaxy. The universe: The Time Lords have their final battle with the Daleks. The creator: Some amazing British guys to whom we owe a major debt, currently helmed by Steven Moffat. The stakes: The Daleks had gotten more and more powerful, and the Time Lords were forced to defend the universe against them. The Doctor, the Time Lord we are most familiar with, fought on the front lines and watched as his brethren were slaughtered by the Daleks. Many other alien races watched the war with interest, wanting to also see the Time Lords defeated. Since time travel was used by both groups, many millions were killed and came back to fight and die again in other times. This made the war especially brutal. Desperate, the Time Lords became more vicious in their tactics and adopted unscrupulous methods to win. The Master, an evil rogue Time Lord and the Doctor's arch enemy, was even resurrected to fight. The outcome: The Doctor does the unthinkable and destroys both the massive Dalek fleet as well as his own homeworld. Gallifrey burns with the Daleks, and the Doctor becomes the last living Time Lord, alone and haunted by what he has done. He swears to keep the universe safe from those who would destroy it, and also perhaps from himself. The universe: The beautiful and complicated world of Middle Earth. The creator: J.R.R. Tolkien, the father of modern epic fantasy and a detailed linguist. The stakes: The evil wizard Saruman the White has joined forces with Sauron to stop the hobbits from destroying the ring. The group is caught in the land of Rohan, in a vast garrison in front of a ravine called Helm's Deep. They are incredibly outnumbered by the legions of orcs and Uruk-hai created by Saruman. The attack occurs at night, during a storm, further hindering the battle. With the Rohirrim forces are a small group of elves (almost all of whom perish) as well as the members of the Brotherhood. Legolas and Gimli turn the battle into a contest. The outcome: The battle is incredibly violent, and the losses are staggering. The orcs and Uruk-hai are almost unstoppable, and the fortress is breached. Thankfully, Gandalf arrives at dawn astride his white horse with massive reinforcements. Between the two groups, the orcs and Uruk-hai are defeated. While this battle is huge, it is not the final battle for Middle Earth. Éowyn, who during the Helm's Deep battle herds the women and children of Rohan to safety, has her moment to shine in the final battle as a shieldmaiden. 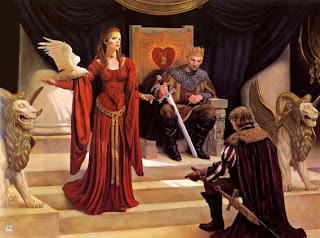 We at Stellar Four love a good kickass woman, and Éowyn is one of our favorites. The universe: Sunnydale, Calif., aka The Hellmouth. The creator: Showrunner Joss Whedon. The stakes: Buffy and her friends are faced with an apocalyptic event: Sunnydale's mayor will ascend to a god-like horror during their graduation ceremony. If the Mayor succeeds, the student body, graduation attendees and the world at large will be fodder or servants of the demon. The outcome: Buffy and her friends have always battled the evils that threatened their community without help from the populace, but not this time. Graduation Day was the first and only would-be apocalypse when the general public joined the Slayer in fighting a Big Bad. When Buffy gives the command during the Mayor's commencement speech, the students throw aside their graduation gowns and reveal their weapons hidden underneath. Many of Buffy's peers die that day as the Chosen One lures the snake-like demon into the explosive-riddled halls, but their efforts would ultimately prove successful. Their sacrifices would mean the town would be safe again for another day. The universe: A world torn by war as the end of an age - and perhaps everything else - draws near. The stakes: The Dragon Reborn, the one man who has any hope of saving the world, has been captured by forces who seek to enslave him at best and execute him at worst. His friends, followers, and fellow channelers of the One Power must retrieve him so that he can face The Dark One and save creation itself. The outcome: The Dragon Reborn's fractious alliance of fanatically loyal desert warriors, a handful of Aes Sedai (women who, like the Dragon Reborn, can channel the One Power) and his childhood friend Perrin initiate a massive offensive to cut their way to where the Dragon Reborn is being held. While the battle rages on, the Dragon Reborn manages to break free. His fellow male channelers, called Asha'man, open a portal to him and he orders them to disperse the forces that had raised arms against him. In a shocking display of brutality, the Asha'man use the One Power to utterly break the elite infantry arrayed against them. The Dragon is victorious, but even his allies are shaken by the means. One of my favorites (and more so than Graduation Day) is the final battle in Angel, Not Fade Away. Though we don't get to see much of LA being SENT TO HELL, the follow-up comic, After the Fall, paints a devastating picture. Oooh, yes, that's a good one! I should really pick up the comic because I'd like to know how Angel fared against that dragon. "The Hand of God" is one of my favorite episodes of new BSG. It's also one of the best war stories I've seen, period. You have the hero who has to prove himself (Apollo), the maverick (Starbuck), and the wise older leader (Adama) who gets the best out of both of them. Throw in the crazy wildcard (Baltar) and the crusty old timer (Tigh) and you have a classic. Thanks, GitM! So glad you agree!